Description: NS Eastbound Intermodal Train at South Bend, In. Description: The former P&N can be seen at the bottom right corner of the picture. These two RR's cross on bridges and both cross the Middle Tyger River at the same time! Description: Late afternoon. Taken from near McCallie Ave bridge. NREX 5071 was CNW 7011. Description: Late afternoon. Taken from near McCallie Ave bridge. Description: At the NS / KCS crew change point in downdown on a very damp morning. Description: 9358 Pulls another horse out from the stable. 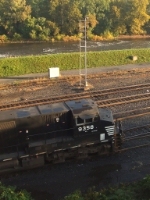 Description: The 2 spots above 2527 are black birds on the wire, train watching too! Description: A stable of thoroughbreds in Union Yard awaiting there next assignment. Description: 262 pulls into the River Yard at 8:20PM. Description: NS SD70M-2 leads this westbound intermodal train, seen here passes the flag at the Cresson engine facility.